To all those who lost their lives during the clashes: to the civilian, 14th. March and to 8th. March deaths. i say in “a street” and not in “the street” because there is no such thing as “one word” in the street(s). she said that things will get calm soon, according to her resources. i realize these two are not lebanese, but let me say something here..
on the 7th. 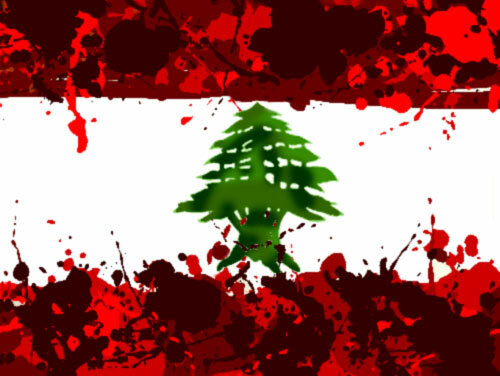 i was the only person who was worried that things will get worse, my lebanese roommates and friends werent as worried, why? they said that these things always happen and soon things will get back to normal. that’s the problem, memory sometimes messes with our readings to situations and hence with our judgments. and it is happening again now when people call what is happening as “civil war” or “occupation”. why? it is so easy to go back to history and project terminologies that were founded then on every single situation where we have two parties fighting on the streets in lebanon. Nassralla was clear, this is not a civil war, this is an armed political pressure on a party that is trying to control resistance’s abilities to protect itself. if resistance is truly protected as Junblat was saying on TV the other day, why did he along with the U.S.-backed government initiated attacks on a very essential factor that protects the resistance (land lines)? why did he initiated the airport issue? there is a U.S.-backed strategical attack launched by the government on resistance now, and HezbAlla wont go this far if things wont get worse in the future. Nassralla was shockingly clear in his speech, they have two demands and nothing more. The government should start to think locally and stop taking orders from Welsh every now and then. The government should rethink its resources. I just came back from the funeral wake of my neighbor’s son. He was 16 and he and his friend were shot this morning in my street. His family owns a bakery and a cafe in my neighborhood. They are also very involved in the local mosque. He and a bunch of other kids always hang out between the bakery and the cafe. They are Hariri supporters by default, like many other Beirut Sunnis. At around 10:30, when the fighting intensity was beginning to decrease, they went out to have a look. The sniper caught them both. 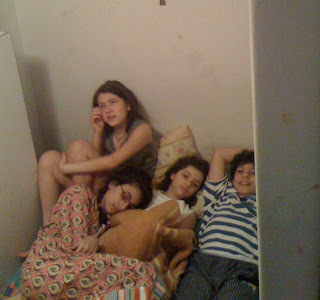 My children and their cousin hiding after coming under fire in our house this morning.